For the band's debut album, see The Meters (album). The Meters are an American funk band formed in 1965 by Zigaboo Modeliste (drums), George Porter Jr. (bass), Leo Nocentelli (guitar), and Art Neville (keyboards) in New Orleans. The band performed and recorded their own music from the late 1960s until 1977 and played an influential role as backing musicians for other artists, including Lee Dorsey, Robert Palmer, Dr. John, and Allen Toussaint. Their original songs "Cissy Strut" and "Look-Ka Py Py" are considered funk classics. While they rarely enjoyed significant mainstream success, they are considered originators of funk along with artists like James Brown, and their work is influential on many other bands, both their contemporaries and modern musicians. Their sound is defined by a combination of tight melodic grooves and highly syncopated New Orleans "second line" rhythms under highly charged guitar and keyboard riffing. The band has been nominated four times for induction into the Rock and Roll Hall of Fame, most recently in 2017. In 2018 the band was presented the Grammy Lifetime Achievement Award. Art Neville, the group's frontman, launched a solo career around the New Orleans area in the mid-1950s while still in high school. The Meters formed in 1965 with a line-up of keyboardist and vocalist Art Neville, guitarist Leo Nocentelli, bassist George Porter Jr. and drummer Joseph "Zigaboo" Modeliste. They were later joined by percussionist-vocalist Cyril Neville. The Meters became the house band for Allen Toussaint and his record label, Sansu Enterprises. In 1969 the Meters released "Sophisticated Cissy" and "Cissy Strut", both major R&B chart hits. "Look-Ka Py Py" and "Chicken Strut" were their hits the following year. After a label shift in 1972, the Meters had difficulty returning to the charts, but they worked with Dr. John, Paul McCartney, King Biscuit Boy, Labelle, Robert Palmer and others. In 1975 Paul McCartney invited the Meters to play at the release party for his Venus and Mars album aboard the Queen Mary in Long Beach, California. Mick Jagger of The Rolling Stones was in attendance at the event and was greatly taken with the Meters and their sound. (p166) The Rolling Stones invited the band to open for them on their Tour of the Americas '75 and Tour of Europe '76. That same year, the Meters recorded one of their most successful albums, Fire on the Bayou. From 1976 to 77 they played in The Wild Tchoupitoulas with George and Amos Landry and The Neville Brothers. Art and Cyril Neville left the band in early 1977, but The Meters still appeared on Saturday Night Live on March 19, 1977, during the show's second season. After the Nevilles' departure, David Batiste Sr. took over on keyboards while Willie West joined as the band's lead singer. Porter left the group later that year and by 1980 The Meters had officially broken up. After the break-up, Neville continued his career as part of The Neville Brothers, Modeliste toured with Keith Richards and Ron Wood, while Nocentelli and Porter "became in-demand session players and formed new bands." In 1989 Art Neville, George Porter Jr. and Leo Nocentelli reunited as The Meters, adding drummer Russell Batiste Jr. to replace Zigaboo Modeliste. Nocentelli left the group in 1994 and was replaced with guitarist Brian Stoltz, formerly of The Neville Brothers. The band was renamed The Funky Meters. They were referred to as "the Funky Meters" as early as 1989. They were billed as such when playing in a tiny venue called Benny's Bar at Valence and Camp streets. The Funky Meters continued to play into the 2000s with Stoltz being replaced by Art Neville's son, Ian Neville, from 2007 to 2011 while he went to pursue a solo career. Stoltz returned to the band permanently in 2011. In 2000 a big offer enticed all four original Meters to reunite for a one-night stand at the Warfield Theatre in San Francisco; by this time Modeliste wanted to make the reunion a permanent one, but the other members and their management teams objected. It wasn't until Quint Davis, producer and director of the New Orleans Jazz & Heritage Festival, got them to "put aside their differences and hammer out the details" and perform at the Festival in 2005. In June 2011 The Original Meters along with Allen Toussaint and Dr. John played the Bonnaroo Music and Arts Festival in Manchester, Tennessee. The six men performed Dr. John's album Desitively Bonnaroo which was originally recorded with the Meters, to a sold-out crowd. The Original Meters also played a set at the 2011 Voodoo Experience in New Orleans. On May 5, 2012 The Meters returned to New Orleans for a performance to a sold-out crowd at the Howlin' Wolf. In late 2012, Zigaboo Modeliste, Leo Nocentelli, and George Porter Jr. played concerts with Phish keyboardist Page McConnell under the name The Meter Men. During his time off from Phish, Page McConnell has continued to play with Porter Jr., Nocentelli, and Modeliste under the moniker of The Meter Men since those shows in 2012. The Meter Men had performed 16 shows together as of spring 2015, with their third annual appearance as a late night act during New Orleans' Jazz and Heritage Festival. In 2014, during The Meter Men's second appearance as a late night act during Jazzfest, the band performed at The Republic on April 26, 2014, after McConnell had headlined the NOLA Jazzfest at the New Orleans Fairgrounds with Phish earlier that day. The Meter Men had also played the previous night at The Republic. 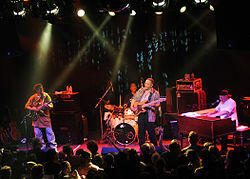 The states The Meter Men had appeared in as of spring 2015 were Massachusetts, New York, Florida, Pennsylvania, Louisiana, Colorado, and Vermont, with one other performance in Washington, D.C.
As of 2017, The Funky Meters tour consistently performing songs by The Meters, while The Meters perform sporadically. The lineup of Neville, Porter, Nocentelli and Modeliste typically bill themselves as The Original Meters to avoid confusion with The Funky Meters. When not performing with The Original Meters, guitarist Leo Nocentelli leads his own group, The Meters Experience, which also performs the music of The Meters. As of 2018, the most recent performance of the original Meters (with all four of the founding members) took place at the Arroyo Seco Festival in Pasadena, California on June 25, 2017. The song "They All Ask'd for You" from the 1975 album Fire on the Bayou remains popular in the New Orleans region and is the unofficial theme song of the Audubon Zoo. Art Neville announced his retirement from music on December 18, 2018. According to Brian Knight of The Vermont Review, "In a sense, the Meters defined the basic characteristics of the groove. While Funkadelic, Cameo, James Brown and Sly Stone are synonymous with funk, these artists look to the Meters for the basic-down to earthy and raw sound." Music critique Robert Christgau called the band "totally original" and placed the compilation album Funkify Your Life: The Meters Anthology on his list of top six New Orleans classics. The Meters' music has been sampled by musicians around the world, including rap artists Heavy D, LL Cool J and Queen Latifah, Musiq, Big Daddy Kane, Run-DMC, N.W.A, Ice Cube, Scarface, Cypress Hill, EPMD, Public Enemy, A Tribe Called Quest, Beastie Boys, Naughty by Nature, and Tweet. Red Hot Chili Peppers covered the Meters' song "Africa", renamed "Hollywood (Africa)", on their 1985 album Freaky Styley. The eclectic jazz-fusion guitarist Oz Noy has recorded his version of "Cissy Strut" twice. Bands such as the Grateful Dead, KVHW, Steve Kimock Band, Widespread Panic, Rebirth Brass Band, Galactic, Jaco Pastorius and The String Cheese Incident have performed songs by The Meters in their concert rotations. The Meters' songs have been used in the movies Two Can Play That Game, Jackie Brown, Drumline, Hancock, Calendar Girls, Hitch and Red, Beer Fest. The band's songs were also featured in the television show The Wire and the video game Grand Theft Auto IV. In 1970, The Meters were named Best Rhythm and Blues Instrumental Group by both Billboard and Record World magazines. The Meters have been nominated for the Rock and Roll Hall of Fame four times since becoming eligible in 1994: 1996, 2012, 2013 and 2017. George Porter Jr. and The Meters were recipients of the Lifetime Achievement Award at the second annual Jammy Awards in 2001. In 2011, the iconic Meters' song "Cissy Strut" was inducted into the Grammy Hall of Fame. In 2013, The Meters received a Lifetime Achievement Award from the Big Easy Music Awards. The band was featured on the 2017 New Orleans Jazz & Heritage Festival's commemorative poster. In January 2018, The Meters were honored with a Grammy Lifetime Achievement Award. Jason Berry; Jonathan Foose; Tad Jones (1992). Up from the Cradle of Jazz. Da Capo Press. pp. 190–200. ISBN 9780306804939. Grace Lichtenstein; Laura Dankner (1993). Musical Gumbo: The Music of New Orleans. W.W. Norton. pp. 153–160. ISBN 9780393034684. Dave Thompson (2001). Funk, Third Ear: The Essential Listening Companion. Hal Leonard. pp. 164–169. ISBN 9780879306298. Jeff Chang (2007). Phil Freeman, ed. Marooned: The Next Generation of Desert Island Discs. Da Capo Press. pp. 195–208. ISBN 9780306816406. Daniel Knobler (February 2011). "Strutting & Scuffling – Here Come the Meter Men". Perfect Sound Forever. ^ "The Meters Honored With Jazz Fest Postal Cachet". www.jazzandheritage.org. New Orleans Jazz & Heritage Festival. April 13, 2015. Retrieved 6 February 2018. ^ a b Dave Thompson (2001). Funk, Third Ear: The Essential Listening Companion. Hal Leonard. pp. 164–169. ISBN 9780879306298. Retrieved November 15, 2015. ^ Grace Lichtenstein; Laura Dankner (1993). Musical Gumbo: The Music of New Orleans. W.W. Norton. pp. 153–160. ISBN 9780393034684. Retrieved November 15, 2015. ^ a b c Stephen Thomas Erlewine. "Allmusic: The Meters – biography". AllMusic. Archived from the original on January 10, 2017. Retrieved August 27, 2014. ^ Linda Seida. "Allmusic: Ziggy Modeliste – biography". AllMusic. Archived from the original on November 8, 2016. Retrieved October 28, 2011. ^ Lisa Respers France (October 5, 2017). "Rock and Roll Hall of Fame Nominees Announced". CNN. Archived from the original on October 11, 2017. Retrieved October 15, 2017. ^ Jason Berry; Jonathan Foose; Tad Jones (1992). Up from the Cradle of Jazz. Da Capo Press. pp. 190–200. ISBN 9780306804939. Retrieved October 28, 2017. ^ Daryl Easlea (2010). "The Meters Rejuvenation Review". BBC Music. Archived from the original on January 9, 2016. Retrieved July 9, 2017. ^ a b Jeff Chang (November 14, 2005). "A bad contract tore New Orleans' Meters apart, but they're back and rebuilding after the storm". San Francisco Chronicle. Retrieved 2010-03-16. ^ Matt Rose (2011-08-17). "Latest Meters reunion to roll on at least through Voodoo Fest". NOLA.com. Retrieved 2014-08-27. ^ "About". Funkymeters.com. Retrieved 2014-08-27. ^ "2006 - 1ST SUNDAY - APRIL 30, 2006". Swagland.com. 2006-04-30. Retrieved 2014-08-27. ^ "B.B. King Blues Club & Grill - THE METER MEN - Oct 31, 2012". Bbkingblues.com. 2012-10-31. Archived from the original on 2014-08-12. Retrieved 2014-08-27. ^ "Phish.net". Phish.net. Retrieved 2016-10-29. ^ "Apr 26, 2014 Setlist". Phish.net. 2014-04-26. Retrieved 2016-10-29. ^ "George Porter, Jr. Appearances". Phish.net. Retrieved 2016-10-29. ^ "Zigaboo Modeliste Appearances". Phish.net. Retrieved 2016-10-29. ^ "Leo Nocentelli Appearances". Phish.net. Retrieved 2016-10-29. ^ "Welcome To The Meters Experience Website". Nocentelli.com. Retrieved 2014-08-27. ^ Nick Deriso (August 4, 2011). "Zigaboo Modeliste on the Meters' 'They All Ask'd For You,' 'Funkify Your Life,' others: Gimme Five". Something Else. Something Else!. Archived from the original on January 25, 2019. Retrieved January 25, 2019. ^ a b Gail Mitchell (December 19, 2018). "Art Neville of Neville Brothers, Meters Fame Announces Retirement". billboard.com. Archived from the original on February 1, 2019. Retrieved March 26, 2019. ^ Roberts, Michael (2008-08-25). "Q&A With George Porter, Jr. of The Meters | Westword". Blogs.westword.com. Retrieved 2014-08-27. ^ Bill Dahl. "Containing previously unreleased material from the Meters' records for Josie Records in the 1960s and 1970s". AllMusic. Retrieved 2014-08-27. ^ Brian Knight. "Get Dazed by the Meters". The Vermont Review. Archived from the original on November 10, 2004. Retrieved March 17, 2016. ^ "Robert Christgau: The Meters Anthology – review". robertchristgau.com. Archived from the original on March 28, 2012. Retrieved October 15, 2017. ^ "New Orleans Classics: Rocking & Rolling on the River". robertchristgau.com (from Rolling Stone, Oct. 6, 2005). October 6, 2005. Archived from the original on September 14, 2015. Retrieved October 15, 2017. ^ "Who Sampled: The Meters". Whosampled.com. Archived from the original on 2017-02-16. Retrieved 2016-10-29. ^ "Deaddiscs.com: Hey Pocky Way". Deaddiscs.com. Archived from the original on 2016-09-14. Retrieved 2016-10-29. ^ "Everyday Companion: The Meters". Everydaycompanion.com. Archived from the original on 2016-03-04. Retrieved 2016-10-29. ^ "Livecheese.com". Livecheese.com. Archived from the original on 2016-07-14. Retrieved 2016-10-29. ^ "The Meters". IMDb.com. Retrieved 2016-10-29. ^ Glickman, Simon; Manheim, James M. (2004). "The Meters". www.encyclopedia.com. Retrieved 6 February 2018. ^ Budnick, Dean (2003). Jambands: The Complete Guide to the Players, Music & Scene. San Francisco: Backbeat Books. p. 62. ISBN 0-87930-745-5. OCLC 52728787. ^ "Grammy Hall of Fame". www.grammy.com. The Recording Academy. 2018. Retrieved 6 February 2018. ^ "The Meters To Receive Lifetime Achievement Award At The Grammys". denver.cbslocal.com. CBS Denver. January 15, 2018. Retrieved 6 February 2018. ^ Allman, Kevin (April 22, 2013). "Winners of the 2013 Big Easy Music Awards announced". www.bestofneworleans.com. Gambit. Retrieved 6 February 2018. ^ Spera, Keith (January 12, 2018). "New Orleans funk legends the Meters to receive Grammy Lifetime Achievement Award". The New Orleans Advocate. Retrieved 6 February 2018. ^ MacCash, Doug (January 27, 2018). "The Meters Win Grammy Lifetime Achievement Award". nola.com. NOLA Media Group. Retrieved 6 February 2018.